A CanSat is a simulation of a real satellite developed in the size and shape of a soft-drink can. The competition aims to develop an interest in STEM careers by offering students a hands-on experience of a space-themed project. 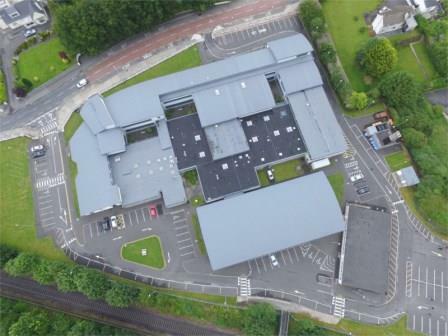 CanSat 2019 was launched during the Space Careers Roadshow at DCU by the team from Marist College, who secured the first Irish victory in the European finals earlier this year. 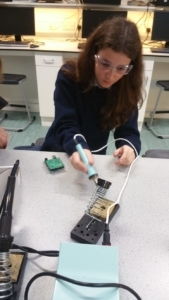 Our OLBCanSat team members; Paula Davila, Ashling McCarthy, Aoife McDermott and Clara Rodriguez will be hoping to replicate the success of the Marist boys over the coming months. Our space engineers will aim to design, build and test a satellite. 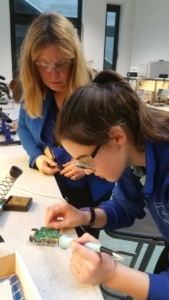 The girls started their project with a day of practical training in preparation for their mission, facilitated by AIT, during which they got to grips with the tasks of soldering and coding. OLBCanSat will be launched to an altitude of a few hundred metres. From here the CanSat’s primary mission will begin; to carry out a scientific experiment and achieve a safe parachute landing. The girls will be attempting to measure air temperature and air pressure during descent. That data will be transmitted to the base for analysis, which the girls will then display on graphs. The secondary mission is currently being defined by the team and we wish them every success.